Originally published in the Yellow Springs News on Aug. 18, 2016. A blog post I wrote about the fair’s strongman contest can be found here. The fair boasts an annual attendance of 65,000 people, including daily guests, season pass holders, exhibitors and vendors, according to fair board treasurer Dennis Nagle. Many of these people stayed inside the fairgrounds in order to be close to their duties for the week. Dozens of RVs and campers formed a small village alongside the fairway and rides. Arriving at 10 a.m. on Thursday, this reporter was able to see the fair get up and running. People emerged from their campers, squinting in the sun, stretching, toiletry bags in hand as they made their way to the nearby restrooms. The rides were shut up for the next few hours, until families started arriving later in the afternoon. The heat certainly inspired a certain lassitude, and the food vendors and exhibitors took time folding back plastic tarps or firing up their deep fryers. Nagle said attendance was slightly down this year due to the high temperatures. A group of food workers sat in a circle smoking cigarettes and trading stories about rude customers. Nobody seemed to sympathize with how hot it is inside a stand selling corndogs or deep-fried vegetables. The rides may have been on pause and the food vendors just starting up, but elsewhere the grounds were full of activity. Various livestock competitions were well underway by 10 a.m. Roosters crowed from inside livestock barns, and cows were being walked between buildings, their caretakers pausing a moment as a cow lifted her tail on the fairway. The owner waited and then cleaned it up, patiently tending to a future prize-winner or literal cash cow, as many of the animals were for sale. Outside of one of the barns was Austin Pence, 22, from Yellow Springs. He was standing with his cow under what looked like a carport. 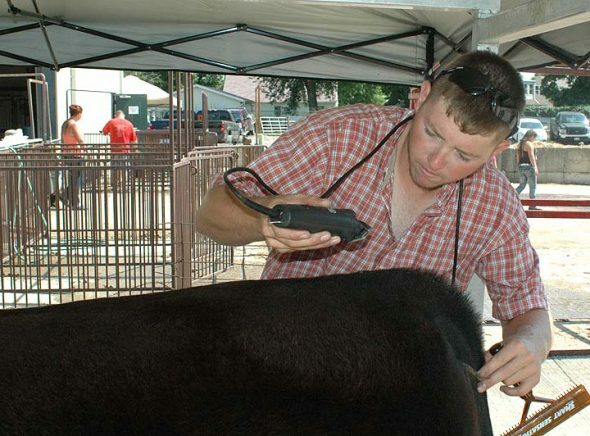 Pence was hovering over the cow’s hindquarters with a set of hair clippers, primping one spot with a hairbrush while the clippers shaved off the slightest bit of extra fuzz. Next to the cow was a cart with a number of tools of the trade, including some scissors and a canister of spray adhesive. Pence had been showing cattle for 13 years, he said, and the pre-show primping is part of the daily routine. His cow is given a daily bath before her hair is blown out. The idea is to train the hair to stand up, he said. The spray adhesive is used to dip and shape the hair. And the cow is fed and watered not long before competition so she looks filled out. The cow should be big-boned and have a wide chest, he explained. Not too spread out, but not too close together. He took a step back and assessed his styling, and then dove back in to trim a few more errant hairs. A few minutes later, after some almost imperceptible trichological adjustments, the heifer was ready. The Junior Dairy competition took place in Building 3. In the center of the building was a show area surrounded by bleachers and animal pens, where cows rested between rounds in the show ring. Families and caretakers lounged about in fold-out chairs by the pens holding their animals. Each pen had a placard hanging over the doorway indicating the people responsible for raising the cow and the names of the people and businesses scheduled to buy it. The ring was bedded with mulch, and three officials sat at an elevated table on one edge. The official responsible for the judgements, the overjudge, was on his feet in the middle of the ring. Pence’s animal was being shown by his friend Jordin Snider. The two had been working on the as-of-yet unnamed heifer for the past year and a half, Pence said. He had previously showed her as a baby. Cattle were walked into the ring by their caretakers. Young men and women alike were decked in their finest show flannel and denim, which almost uniformly included fancy embroidering on the seat of the pants. A special cow comb jutted out of contestants’ back pockets. Once in the ring, the humans and animals walked a few laps and then stopped in a semi-circle. A long metal pole with a small hook on one end was employed to get the animals into show position. The hook was lightly used to position the animals as though they were paused mid-trot. The caretakers stood behind them, shifting from one foot to another and running the comb through the cows’ hair. The official made his way slowly around the contestants, taking a few steps before adopting a look of scrutiny and then taking a few more steps. After his deliberations, he picked up a microphone and announced his opinion about all of the contests, running through all of their qualities and faults in rapid succession. He made his way around to each contestant. Eventually he made his way to Pence’s cow. Pence walked over to consult with Snider about the next round. As Champion Cross Breed, their heifer was going to compete in the championship round. Some last minute primping was completed as quickly as they could, as the final round was scheduled to start only a few minutes later. “Don’t let her get dirty!” he called after Snider as they lined up to enter the ring. One contestant had had two cattle win so far. He walked one cow in, while a friend walked in the other. One contestant looked around nervously as a cow resisted being led and stepped slightly out of line. The hooked pole was run gently over the cow’s underside, and the cow settled down. Pence gestured at Snider from outside the ring. He acted like he was propping up oversized ears. “The ears!” he mouthed. “The ears!” Snider nodded. The judge was silent with characteristic scrutiny. He praised one cow’s “structural design” and walked over to another. After some deliberation, the overjudge decided on the best in show. Pence and Snider’s heifer had to be content with the win in her own division. The barn’s royalty walked over to the winner and the runner up and presented them with the prizes: a translucent, dark blue lamp embossed with the silhouette of a cow. Written next to it was “Reserve Heifer — 2016 Junior County Fair.” Friends and family alike ran over to the winners, patting the humans and animals on their heads in victory.